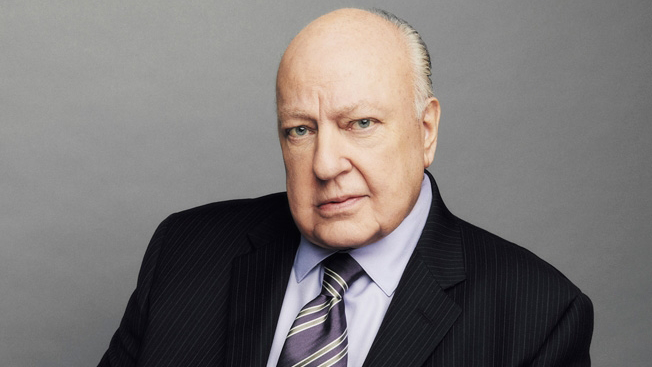 Roger Ailes, who co-founded Fox News in 1996, is leaving the network. After a flurry of bizarre reports earlier this week, confirmed then quickly denied, about Roger Ailes' exit from Fox News, it's now official: The chairman and CEO is departing the top-ranked cable news network he co-founded in 1996. Ailes has resigned, effective immediately, 21st Century Fox announced. Rupert Murdoch, executive chairman of 21st Century Fox, will take over as chairman and acting CEO of Fox News and Fox Business Network. "Roger Ailes has made a remarkable contribution to our company and our country. Roger shared my vision of a great and independent television organization and executed it brilliantly over 20 great years," said Murdoch in a statement. "I am personally committed to ensuring that Fox News remains a distinctive, powerful voice. Our nation needs a robust Fox News to resonate from every corner of the country. "To ensure continuity of all that is best about Fox News and what it stands for, I will take over as chairman and acting CEO, with the support of our existing management team under Bill Shine, Jay Wallace and Mark Kranz." 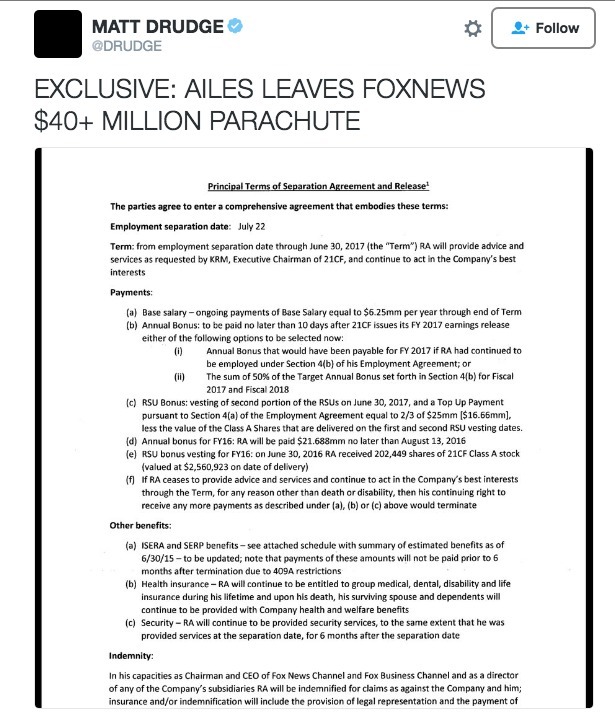 The official confirmation of Ailes' departure follows a wild turn of events on Tuesday afternoon, when Drudge Report posted and then deleted the news that Ailes would be leaving the company after receiving a buyout from Fox News of at least $40 million. At the same time, Matt Drudge also tweeted, then deleted, what seemed to be a separation agreement between Ailes and Fox News, which listed his final day at the company as July 22. Ailes' exit comes two weeks after he was sued for sexual harassment by former Fox News anchor Gretchen Carlson, whose 11-year employment at the network ended June 23. The lawsuit, filed in the Superior Court of New Jersey in Bergen County on July 6, claimed Ailes called Carlson a "man hater" and "injected sexual and/or sexist comments and innuendo into their conversations." In letter from Ailes to Murdoch, obtained by the Drudge Report, Ailes said, "With your support, I am proud that we have built Fox News and Fox Business Channels into powerful and lucrative news organizations that inform our audience and reward our shareholders. I take particular pride in the role that I have played advancing the careers of the many women I have promoted to executive and on-air positions." Ailes added, "Having spent 20 years building this historic business, I will not allow my presence to become a distraction from the work that must be done every day to ensure that Fox News and Fox Business continue to lead our industry. ... I am proud of our accomplishments and look forward to continuing to work with you as an adviser in building 21st Century Fox." Murdoch held a series of meetings this afternoon with Fox News staffers, to let everyone know that he is now in charge. "He thanked us for all the work we were doing. And he said it's been a difficult 10 days or so, and he said, 'I'm here and I'm in charge,'" Fox News anchor Greta Van Susteren told Adweek and TVNewser not long after the news broke. Other than Ailes leaving the channel he co-founded nearly 20 years ago, Van Susteren said Murdoch told staffers, "he will be keeping things status quo. There's no change, except that Roger won't be there." Fox News' chief news anchor Shepard Smith declined to comment about Ailes' departure when approached by Adweek today at the Republican National Convention in Cleveland, shortly after the news broke. Smith would only say, "It's very nice to see you." While Fox News and Fox Business anchors like Greta Van Susteren, Kimberly Guilfoyle and Maria Bartiromo publicly supported Ailes, other former Fox News staffers anonymously told CNNMoney that they had also been harassed by Ailes but were reluctant to speak out due to nondisparagement clauses. Meanwhile, the network's star anchor, Megyn Kelly, had remained conspicuously silent about the allegations. Then on Tuesday, New York magazine reported that Kelly told 21st Century Fox's investigators that Ailes made unwanted sexual advances toward her 10 years ago when she was at Fox News. That news seemed to have been the last straw for News Corp. chief Rupert Murdoch and his sons, 21st Century Fox co-chairman Lachlan Murdoch and CEO James Murdoch. According to the New York report, 21st Century Fox lawyers had given Ailes a deadline of Aug. 1 to either resign or potentially be fired for cause. Soon after, the news of Ailes' departure briefly appeared on the Drudge Report, setting off a surreal chain of events in which some outlets "confirmed" Ailes' exit while his spokesperson, Irena Briganti (who could also be on the way out, New York reported earlier today), told Adweek and other outlets that the news was "completely wrong." Those "confirmations" were later walked back by the network, as negotiations continued to finalize the terms of Ailes' departure. Carlson, who joined Fox News in 2005 and was co-anchor of the network's top-rated morning show, Fox & Friends, for more than seven years before she was replaced by Elisabeth Hasselbeck, claimed that things came to a head in September when she met with Ailes, whom she said told her, "I think you and I should have had a sexual relationship a long time ago." After the suit was filed, Ailes called the allegations "false," "defamatory" and "wholly without merit." In a lengthy interview with Adweek last November, when he was named Adweek Media Visionary for 2015, Ailes said his relationship with James and Lachlan Murdoch was "very good." "I don't think they knew, and I don't think I knew, how it was going to work," he said at the time. "It's not contentious in any way." It remains to be seen who will replace Ailes at Fox News and whether any of his most loyal staffers will follow him out the door. Bill O'Reilly, Sean Hannity and Van Susteren have clauses in their contracts that allow them to leave the network in the event that Ailes leaves, according to the Financial Times. Shortly before Carlson filed her lawsuit, O'Reilly, who is going to be 67 this year, told Adweek he's not sure how much longer he wants to continue doing his show. "I don't know," he said. "I go day to day. I don't want to work this hard much longer. I know that." Ailes will remain as a 21st Century adviser to Murdoch for the time being, as he plans his next move. When asked by Adweek last November what else he hoped to accomplish, Ailes said, "I don't feel any different in my brain than when I was 30 years old. I have the same sort of reaction to new ideas and new things as I did then. I realize I look bad, but I don't feel bad. I'm constantly trying to invent different ways to do things. If you're going to be a television executive, you have to change with the times."